MANILA, Philippines – When the college basketball world was young, it was the University of the Philippines that was the first power. They won a few titles before Ateneo upended them in 1929 and eventually became a basketball power in its own right. Their renaissance began in the early 1980s when they managed to pick up many of the San Beda Red Cubs after their school briefly left the NCAA. However, they faced nothing but heartbreak in the finals. That is until their own version of Moses — in the form of Benjie Paras — led them to the Promised Land. Thirty-two years later, they managed to snag that dominant center in Bright Akhuetie, and like Benjie Paras before him, a refugee from the NCAA, he’s had an MVP season. And now there is all the more reason to “Bo-liev” — as the Maroon faithful put it — that the long wait is finally over. In 1986, the dominant team was the University of the East. Allan Caidic had graduated, and that left Jerry Codinera to hold the fort. He did have a lot of capable help though and it seemed like they would nip Maroon Pride in the bud as they defeated UP in both elimination round games. Come the finals, it was all UP. And in that finals, it was the third man in their Big Three — the other two being Eric Altamirano and Ronnie Magsanoc that year who hurt UE — and that is now the man they call “Coach E”. UP’s Big Three goes by the name of Bright Akhuetie, Paul Desiderio and Juan Gomez De Liaño. When I watch Juan Gomez De Liaño, I am reminded by Jeron Teng; although more athletic. When Teng came into the league, he was nipping at the heels of a Ravena — Kiefer Ravena to be exact. Now, Gomez De Liaño is the one tugging at the cape of that Superman named Thirdy Ravena. We all know what Teng did — he led DLSU to two titles. And UP has stockpiled on nuclear weapons that they will unleash next season. But why wait until next season? There are similarities today, but the basketball world has turned around. Ateneo, FEU and La Salle lord it over the league while UE is down there (and that is putting it mildly). UP has made all sorts of noises in the last three years picking up big wins here and there. They took the big step of making the Final Four and then now, the Finals. And they Bo-lieve it is destiny — there is another Paras, Kobe Paras to be exact, and this massive reinforcement from La Salle Greenhills in Ricci Rivero both suiting up, albeit for next season. In 1986? That was Joey Guanio. As for Bo Perasol — such a sweet redemption. After all, his first foray in college coaching was with Ateneo where he tasted a modicum of success. After the end of his three-year coaching stint with the Blue Eagles, he returned to his alma mater where he has enjoyed success. It is rather strange that will he be coaching not only against his former team but also against some of the players helped recruit. Standing in their way is Ateneo, an NCAA refugee in its own right, which went through two long droughts before they fought their way out of the rut. And now they are in their 13th UAAP finals berth (winning nine of them). They have fended off the challenges. 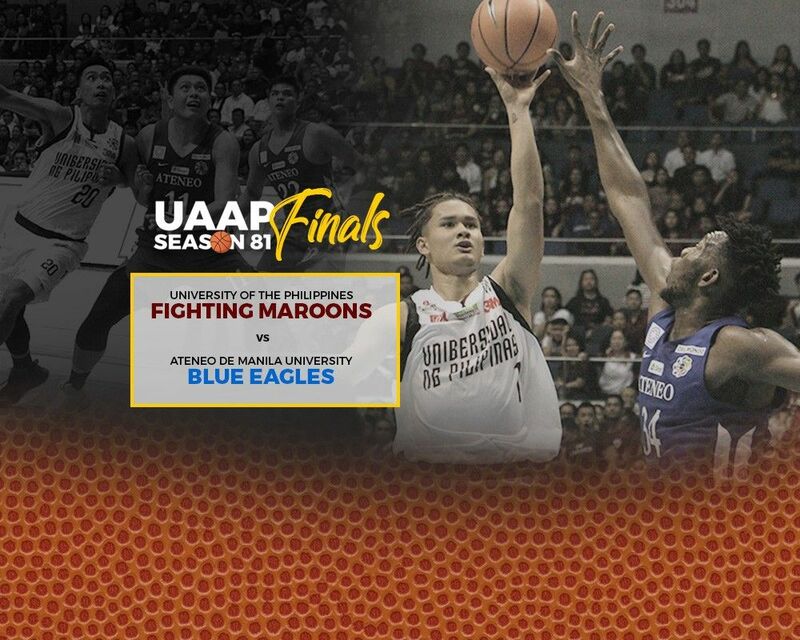 Like UP, they somewhat struggled to find their groove in the first round (but had to deal with a suspension and injuries) before making a run; hence, a battle between the two hottest teams in the league. After Ateneo regained the crown in 2002, the joke, especially among its rivals from Taft, was that it would take another 14 years to win another championship. It took exactly six years — the beginning of what eventually was a historic five-peat. When that ended, the question was, when would that campus along Loyola Heights taste the bubbly once more? It took five years. And now there is a chance to continue the run. You can bet there is a lot of pressure on Ateneo’s shoulders. They are up against a rival, one that is coached by their former bench master who will not say this so I will say it for him — he wants to prove a lot of people in the blue side of Katipunan wrong. Furthermore, the whole 2019 has been a banner one — three summer league crowns and a sterling William Jones Cup appearance.But that might not be remembered if the defense of the crown goes south. When these two teams tangled in the second round, there was that incident between Ravena and Desiderio. They might be Gilas Cadets teammates, but make no mistake, they’ll be at each other come game time. There is so much drama, so many subplots in this Finals match-up. Two premier schools. The first two college basketball powers in Philippine history.